The coin was struck at the Czech Mint, having a mintage of 1000 pieces. We are grateful to Mr. Yu_L.Yan that sent us pictures of this coin. 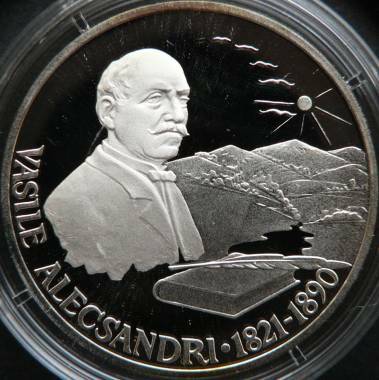 The Romanian poet, dramatist and proser Vasile Alecsandri was born at Bacău in 1821 (or maybe in 1818 or 1819), being son of vornic Vasile (at the time, only medelnicer) and of Elena. Vornic was a state official charged with internal affairs problems, and also judge at the law court, and medelnicer was a boyar that served at the table of the ruler of Moldavia. Vasile Alecsandri has studied at home with Gherman Vida, then at the school of the Frenchman Victor Cuénim from Iaşi, then in France, at Paris. Gherman Vida, a monk from Maramureş, was the author of Gramatica româno-franţuzească (Romanian and French Grammar), published at Buda in 1833. 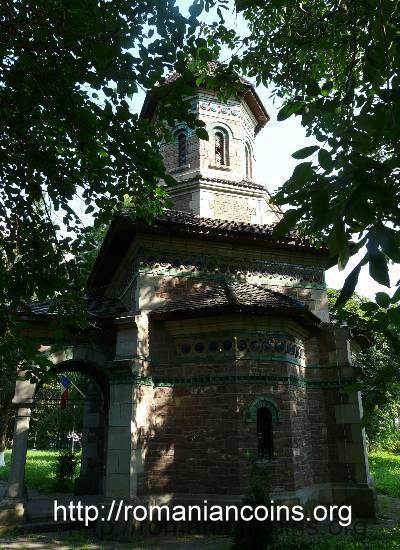 He brought with him in Moldavia the manuscript of the Gheorghe Şincai's chronicle. Victor Cuénim was an ex-officer in the Napoleonic army. 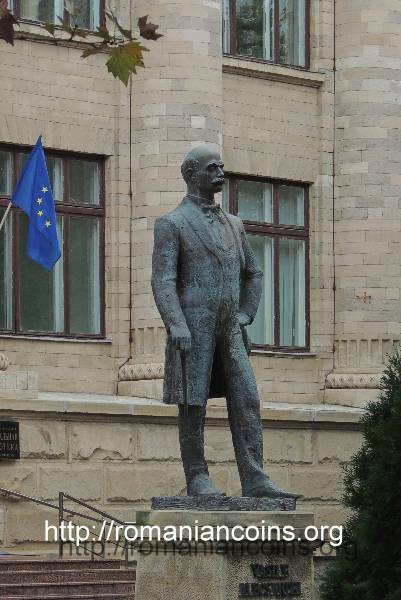 In 1840-1842 he was, together with Costache Negruzzi and Mihail Kogălniceanu, director of the National Theater of Iaşi. 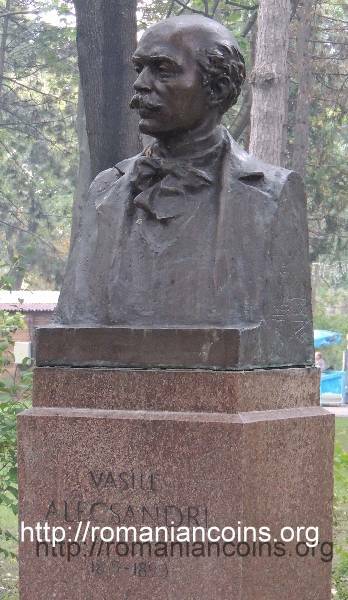 He was a collaborator of "Dacia literară" (Literary Dacia, 1840 - he debuted there with the short story "Buchetiera din Florenţa", Bouqueteer of Florence) and of "Foaie ştiinţifică şi literară" (Literary and Scientific Paper, 1844 - the magazine should have born the name "Propăşirea", Thrift, but the censor did not agree, arguing that thrift is a revolutionary word!). He was the owner of "România literară" (Literary Romania, 1855). Alecsandri was member of the literary society Junimea of Iaşi (that set the ground for the modern Romanian literature in the 19th century), and member of the Romanian Academy. A great part of his opera was published in "Convorbiri literare", Literary Conversations, the magazine from Iaşi of the forementioned society of Junimea ("Youth"). 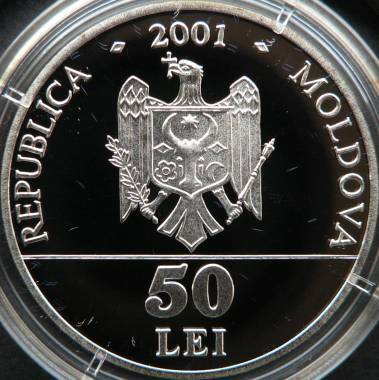 Alecsandri participated to the 1848 Revolution in Moldavia. The bayonets of the governmental soldiers defeated easily the revolution and Alecsandri fled to the Austrian Empire. He was a member of the unionist party, being personal friend of prince Alexandru Ioan Cuza, who united the two Romanian Principalities in 1859 under his rule. Later he was member of the Parliament and also minister. Between 1885 and 1890 he was the minister of Romania at Paris. In the times of king Carol I he was considered the poet of the royal court of Romania. Vasile Alecsandri lived many years at his estate of Mirceşti, and he was surnamed "the bard of Mirceşti". The works of Alecsandri are representative for his epoch. 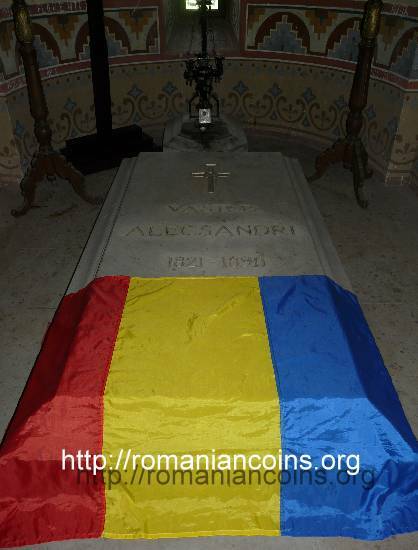 Until Mihai Eminescu, Alecsandri was considered the greatest Romanian poet, being very respected. 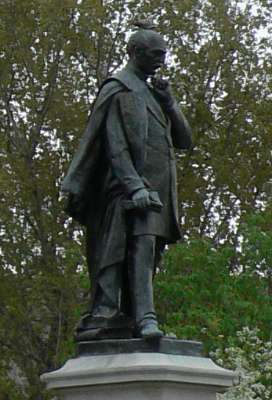 For his poem "Cîntecul gintei latine", Song of the Latin Gens, he won the prize of the Félibriges (the association of the Provençal writers, founded by Frédéric Mistral). This success was very appreciated by the Romanians. The best known poetry volumes of Alecsandri are "Doine şi lăcrămioare" (Doine and lilies of the valley, doina being a typical Romanian popular song, expressing yearning and grief, 1853), "Pasteluri", "Poezii poporale. Balade (cîntice bătrîneşti) adunate şi îndreptate de ..." (Popular poems. Ballads (old songs) gathered and corrected by ... ,1852, two volumes), "Ostaşii noştri" (Our Soldiers, 1878, gathering the poems dedicated to the Independence War of 1877-1878). As dramatist, Alecsandri wrote comedies as "Iaşii în carnaval" (Iaşi in Carnival), "Chiriţa în Iaşi" (1850) or "Chiriţa în provinţie" (1852). Alecsandri wrote the dramas "Despot vodă", "Ovidiu" and "Fîntîna Blanduziei", and the fairy play "Sînziana and Pepelea". The prose of Alecsandri is still readable (e.g. 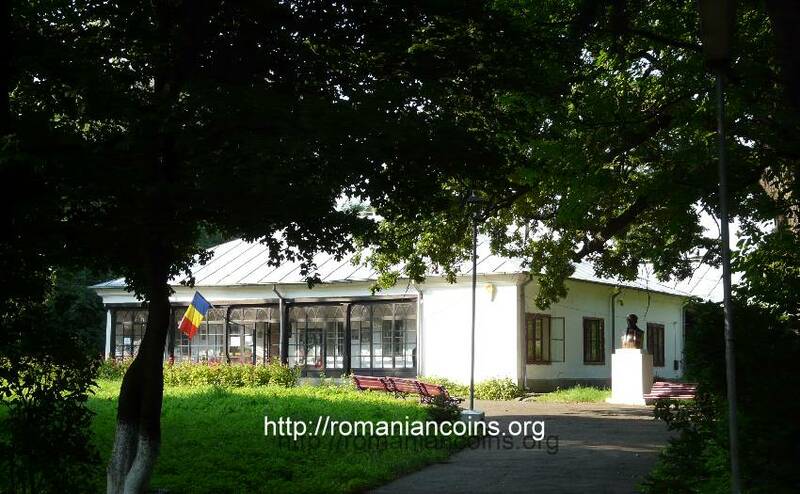 "Istoria unui galbîn", Story of a Gold Coin, and "Balta Albă").